CHECHNYA – The Chechen village of Gekhi has been subjected to artillery fire from federal Russian troop positions. The shelling was called in by soldiers after an attack by guerrillas on a military unit stationed in an adjacent district. Several homes in the village have suffered significant damage, but fortunately there are no civilian casualties. Last night, guerrillas carried out an attack on a military unit on the outskirts of the village of Bamut in Chechnya’s Achkhoy-Martanovsky district. As a result of the battle one soldier was killed and three were wounded. There are no reports of casualties among the guerrillas, who withdrew into the surrounding forest. In order to avoid unnecessary casualties among the troops, the military did not pursue the guerrillas, but called in artillery fire on the supposed path of their retreat. Later, in the middle of the night, artillery shells began to fall on the outskirts of Gekhi, in the neighbouring Urus-Martanovsky district. According to the testimony of Gekhi residents, more than twenty shells exploded in the village. Several homes located on the edge of the village suffered substantial damage, including broken windows, window frames and door frames. In addition, as the result of a cut in energy supply lines Gekhi and the neighbouring village of Valerik were left without gas and electricity. The district administration has said that these will be restored by this evening. 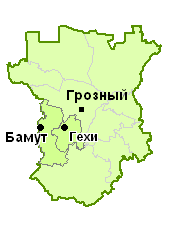 Nevertheless, the incident has seriously alarmed Gekhi residents, who do not understand how the soldiers could have managed to establish the guerrillas’ location, as the distance between Bamut, situated on the border with Ingushetia, and Gekhi, in the central part of Chechnya, is about 25 kilometres. After the incident, representatives of Chechnya’s military command arrived, and on the orders of the commandant brought to the village the soldiers directly responsible for the shelling. "The soldiers were all drunk. They swore they hadn’t shelled the village deliberately, and that it was all a mistake. They said they’d been given the wrong coordinates," Gekhi resident Vakha Kavkaliyev, six of whose houses and apartment buildings were damaged, told Prague Watchdog’s correspondent. He said that he was going to file a lawsuit against the military and seek compensation for moral and material damage.